Radiius has today launched a new product called ‘Bee’ on Indiegogo. This is yet another device which is designed to assist consumers in paying for goods via a digital device. Although compared to those other solutions, Radiius is positioning Bee as “the world’s smallest, biometrics enabled digital wearable wallet.” Making this a product which could be ideal for those looking for a compact, secure, and feature-rich digital payment solution. While building Bee, we had one aim in mind – to bring minimalism to using your legacy wallet, and completely cut down the hassle of using debit & credit cards. We amazed ourselves with how amazing Bee turned out to be, and we can’t wait for you to get your hands on one. With Bee now on the onset of its public launch on the 12th of September, we answer a few common questions that people have been asking about our product. How is Bee different form Apple Pay and Samsung Pay? Fundamentally, we believe that your wallet should not really be dependent on your choice of smartphones. What happens when I change my phone, or if I use a non-Apple, non-Samsung device? What happens if my mobile constantly runs out of charge? Do I wait to charge to pay? How about wanting to give my kid a pre-paid card and not have to worry about it getting lost or stolen? On a different note, there might be times when you are out for a run, and you do not wish to carry your wallet or your phone along? Bee is designed to be agnostic of hand-set types, operating systems and host devices. So, I can strap it to my watch, fitness band, key chain or hand bag – whatever I’m comfortable with. In the very near future, we will also have a mobile case with our technology embedded in it. Our philosophy is to reduce the number of gadgets one carries, or at least provide versatility so it seamlessly integrates into the user’s lifestyle. At the same time, it significantly enhances security when compared to cards. Its protected by a biometric sensor and one can temporarily or permanently disable or delete cards using the BeeHive App on the phone. The future of payments is hands-free, and we are taking the first steps towards it. Will I need to charge it? No, the Bee device will come with a 2-year non-rechargeable battery. So, you don’t have to carry any charging mechanism around. How does it work with wearables like a smart watch? Bee will seamlessly pair with any Bluetooth-enabled wearable (almost all smartwatches are Bluetooth enabled). All one needs to do is mount the Bee on to the smartwatch strap, pair with the watch and you will have access to all the cards stored on Bee, on your smartwatch display using the BeeHive app. While paying – select the card you want to use and simply tap to complete payment from the selected card. Similarly, it pairs with a mobile phone with the BeeHive app on it. Does that mean that Bee would not work without a smartwatch? Not at all! Bee is versatile. 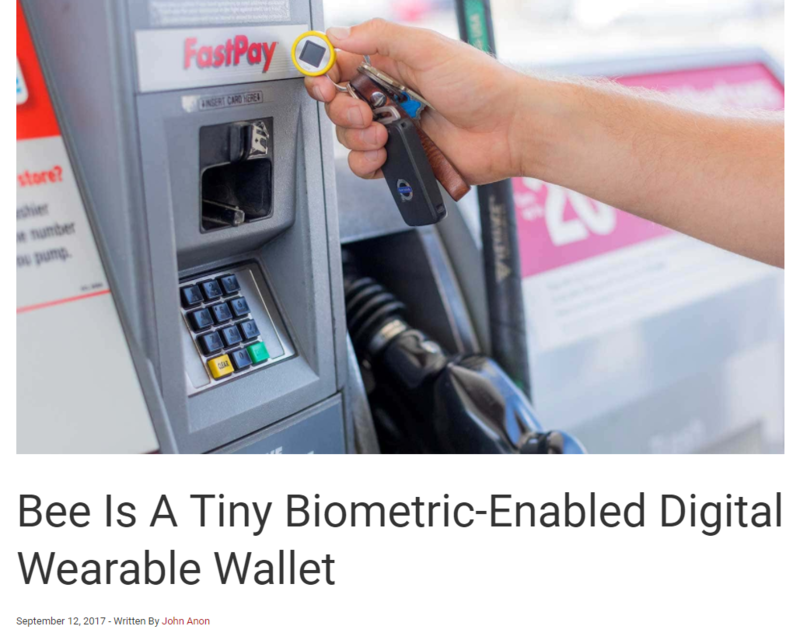 It pairs with smartwatches and smartphones to provide users options to select a card on the screen, or it will work with a car key chain or on your hand back or fitness tracker without the need to select a card, since a default card would be preselected. This default card can always be changed at will using the BeeHive App. Would Bee come with its accessories? Bee’s versatility extends to its accessories as well. It comes with a strap and a key chain as options. Now you can really carry your wallet in your everyday devices, thanks to Bee! – Rajeshwar Mitra, Co-Founder & CEO, Radiius.